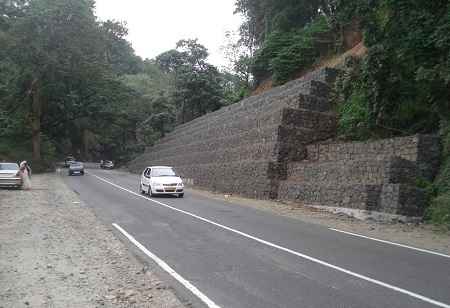 Maccaferri gabion baskets were used for a landslide mitigation project in Kerala. The solution was deployed easily and quickly assembled and provided the advantage of being sustainable, resilient and flexible in nature. Maccaferri Gabions have been used for numerous transportation infrastructure projects in India. These modular units are often used either in conjunction with Reno Mattresses, as demonstrated by an environmental/hydraulic and erosion control project in Nashik, Maharashtra, or by themselves as in an environmental/landslide mitigation and slope protection project in Kudiran, Kerala. The National Highway 47, commonly referred to as NH47, is a 640KM long highway. The highway passes through a variety of terrains, including coastal areas and mountain ranges. From Trichur to Palakkad, the road passes through several picturesque locations; one of them is Kudiran. Due to heavy rainfall, the proposed site at Kudiran suffered a significant landslide. This event resulted in severe traffic jams and delays for those travelling in the region. The landslide could have triggered a major disaster, as the 11KV power transmission tower, mounted on the top of the slope, also came down with the slide. The National Highway Authority of India asked Maccaferri India for a solution that could be rapidly installed. Maccaferri suggested a gabion retaining wall that is flexible, free draining, permeable, environmentally friendly, quick and easy to assemble and cost-effective. A gabion wall of approximately 9m height was constructed, with a coir mat provided to stabilize the surcharge slope. The speed of assembly achieved on site was remarkably quicker than that which would have been acheived by any other type of conventional structure. The finished structure has vegetation starting to grow on its surface and is proving our fundamental commitment to sustainable development.